The Death of Cook, John Cleveley the Younger, 1784, collection unknown. Detail from The Death of Cook, John Cleveley the Younger, 1784, Wikimedia Commons. Detail from The Death of Cook, John Cleveley the Younger, c.1784, Honolulu Academy of Arts via Wikimedia Commons. 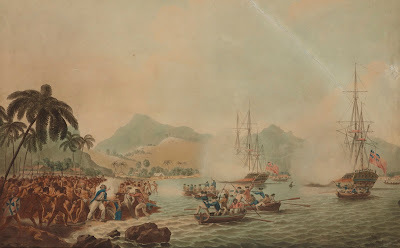 View of Owhyhee, one of the Sandwich Islands (Known as The Death of Cook), John Cleveley the Younger, published posthumously by Frances Jukes, 1788, Museum of New Zealand Te Papa Tongarewa. 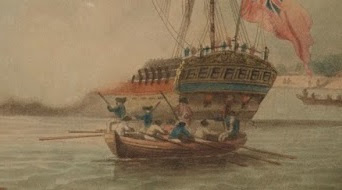 John Cleveley the Younger, a prolific marine artist, followed in the footsteps of his father. Unlike other marine artists, the Cleveley family maintained connections to the world of common sailors. John Cleveley the Elder and his son James were both ship's carpenters. 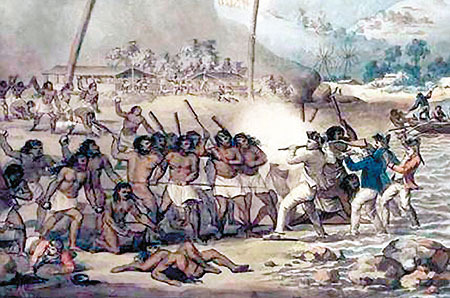 James was lucky enough to join Captain Cook's fateful third voyage aboard the Resolution. It is quite possible that he personally witnessed the death of Captain Cook, and so could inform his brother John's work on the subject. For centuries, copies of Cleveley the Younger's depiction of Captain Cook's death could be found in collections around the world, including some of those shown above. In 2004, the original painting turned up for auction at Christies, where it caught more than three times the expected price. Much of this was due to the difference between the original and the copies. 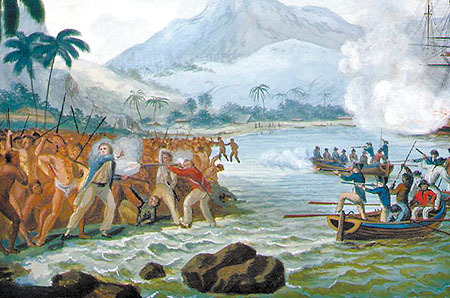 As reported at the time, Cleveley showed Cook clubbing his musket and fighting with the natives of Hawaii, rather than fleeing as in the subsequent, sanitized versions. 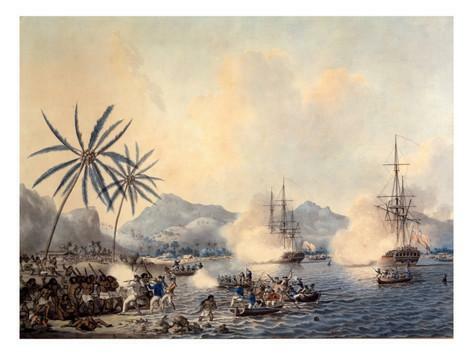 The sailors themselves are clad in red, brown, and blue jackets, with white trousers, and one or two trousers with narrow vertical red or blue stripes. One oarsman even appears to be wearing a striped jacket. Round hats make up the headwear of the common sailors in Cleveley's piece. I wonder if that striped jacket could be one of the cork jackets brought with the expedition? "I ordered all the men to put on cork jackets, which had been sent with us to be made use of upon such occasions. By the help of these jackets, which not only assisted the men in swimming, but prevented their being bruised against the rocks, we got off a considerable quantity of water and wood, which, without such assistance, we could not have done..."